Note: this advice is not written by a medical professional and does not constitute health advice. If you have concerns about occupational hazards or hearing damage from loud noises, please discuss with a qualified medical professional. Hub Guitar assumes no liability for this advice. Are you at risk of hearing loss? Hearing loss is not something that most people worry about. We know that it comes naturally with age, but we rarely think about the ways in which we may be inviting damage to our inner ear. Hearing loss caused by exposure to loud noises will rarely cause total deafness, much less premature death. With many of our concerns reaching a higher priority, we neglect to think about how our exposure to loud noises may affect our risk. In doing so, we may underestimate the loss in quality of life that can be caused by this impairment. 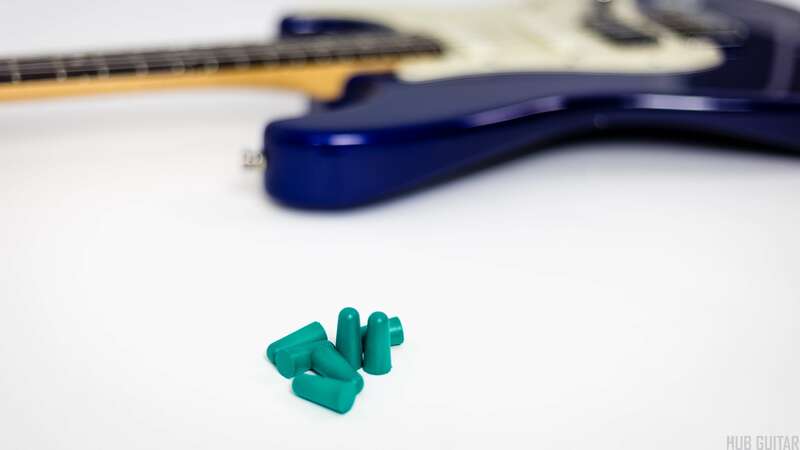 If you ever have the chance to meet a group of older musicians—the kind who toured frequently, played in clubs, and were exposed to loud noise as an occupational hazard—you will see just how prevalent hearing loss is among musicians. Half of all hearing loss is preventable. And nothing could be more preventable than hearing loss caused by exposure to traumatic noises. Exposure to loud noises can cause damage to the inner ear. This damage accumulates over time, and the amount of damage will vary from one person to the next. Hearing loss may result from repeated and prolonged exposure to any sound at or above around 90 dB. Examples of such sounds include: electric tools, motorcycles and loud machinery. Guitar amps can easily produce noises at this volume. Short-term exposure to these noises may not always result in damage. However, if the noise is loud enough, and the exposure is long enough, damage to the ear is almost inevitable. Hearing loss may also result even from a single and momentary exposure—provided that the noise is loud enough. Unprotected close-proximity exposure to noises exceeding 140 dB may cause permanent damage, even after a single incidence. Noises loud enough to do this include: gunfire, jet engines, and—you guessed it—Rock concerts, which can peak at 150 dB. What should you do to limit your exposure to loud noises? Have an occupational hazard, such as loud machinery in the workplace? Listen to music on your headphones? Frequently practice at high volume levels? Play in a band with a drummer? Frequently visit loud bars or clubs? Attend concerts often—or perform in them? Each of these risk factors has only two possible solutions: limit exposure/volume, and wear hearing protection. In the US, OSHA sets limits on noise exposure in the workplace. Your employer should be able to help you get protection, such as heavy ear covers. When listening to music on a pair of headphones, be sure to keep the volume low. If you rehearse with other musicians, there is no need to play too loudly. And before you get into an amplitude war with the drums, ask the drummer to play more lightly. A good one can. If this fails, there are ways to reduce the sound of the kit, such as swapping out for more wimpy kicks and snares, and putting pillows inside of them. A good drummer can play softly. Do not be shy about asking a drummer to do this. For musical situations, you can wear a pair of Etymotic Research High-Fidelity Earplugs[? ]Affiliate Link. These can reduce noise exposure by up to 30 dB or so. Some of your friends may mock you for wearing earplugs. you’ll have to endure the abuse now, but know that eventually you’ll be able to serve up as many comebacks as you like and they won’t even be able to hear you. Take care of your ears, and you can enjoy listening to and playing music for a lifetime. Abuse your own ears, and you may have that gift taken away from you too soon, and for no other reason than your own negligence. Fact Sheet: Deafness and Hearing Loss —World Health Organization. Accessed December 16 2015.